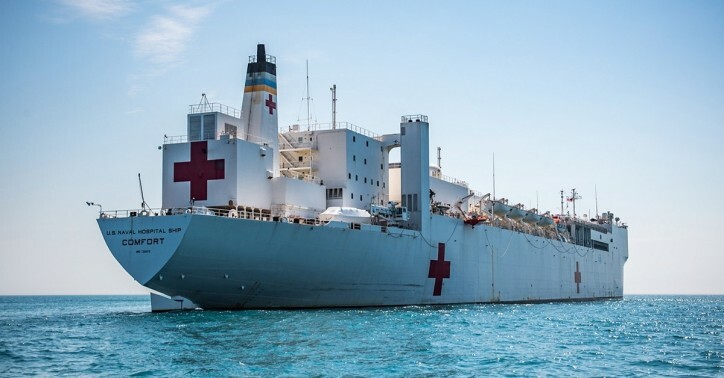 The Pentagon is preparing to dispatch a hospital ship to Colombia and possibly other parts of South America to help relieve strain on health care systems overloaded by an influx of hundreds of thousands of Venezuelans who have fled that crisis-racked nation, Defense Secretary Jim Mattis said Friday. “It is absolutely a humanitarian mission,” he told reporters returning with him to Washington after a six-day tour of South America. Mattis would not say when the USNS Comfort would arrive off the coast of Colombia, but it apparently will not be in the next few weeks. Dana W. White, the chief Pentagon spokeswoman, said it would be “in the fall,” but she would not be more specific. As a result of a dire economic and health care situation, rising numbers of Venezuelans are joining an exodus that has set off alarms across Latin America. The United Nations said earlier this week that an estimated 2.3 million Venezuelans have fled the crisis-torn country as of June, mainly to Colombia, Ecuador, Peru and Brazil. Mattis said Colombian President Ivan Duque embraced the Comfort proposal during talks Friday morning in Bogota. “They not only agreed in principle, they gave details on how we might best craft the cruise through the region,” Mattis said. Some details of the plan for dispatching the Comfort from Norfolk, Virginia, have not yet been worked out, Mattis said. The ship may visit other South American countries also feeling effects of the refugee problem. “We are going to go where the need is greatest,” he said, but that will not include Venezuela. The Comfort has 12 fully-equipped operating rooms, a 1,000-bed hospital facility, digital radiological services, a medical laboratory, a pharmacy, an optometry lab, a CAT scan and two oxygen-producing plants. The ship also is equipped with a helicopter deck capable of landing large military helicopters. It has a side port that enables the crew to take on patients at sea.